Yesterday, Brandon Warne took a trip down memory lane, reminiscing on his favorite deaths in baseball history. He couldn’t quite remember them all. 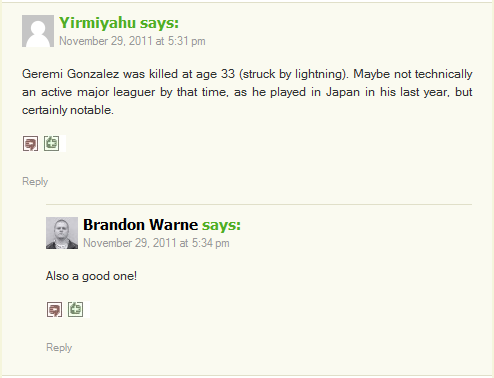 But the commenters at FanGraphs were helpful, as always. No word yet how Warne feels about Dave Cameron. It’s not completely clear in his latest post whether Phil Birnbaum is aware that George Steinbrenner died a month ago. Why else the strange, repeated use of present tense with his thoughts or actions? That doesn’t speak well of a true SABR. He may be flirting with severe avoidance of sound sabermetric principles here. Nevertheless, Birnbaum’s Sabermetric Research blog remains the preeminent place on the internet to watch shoddy academic work go up in flames. And my Burn-Baums page is the first and only compilation of his greatest hits. Though it’ll likely remain forever a work in progress.